Ambassador presenting the Mir Bacha Khan medallion. 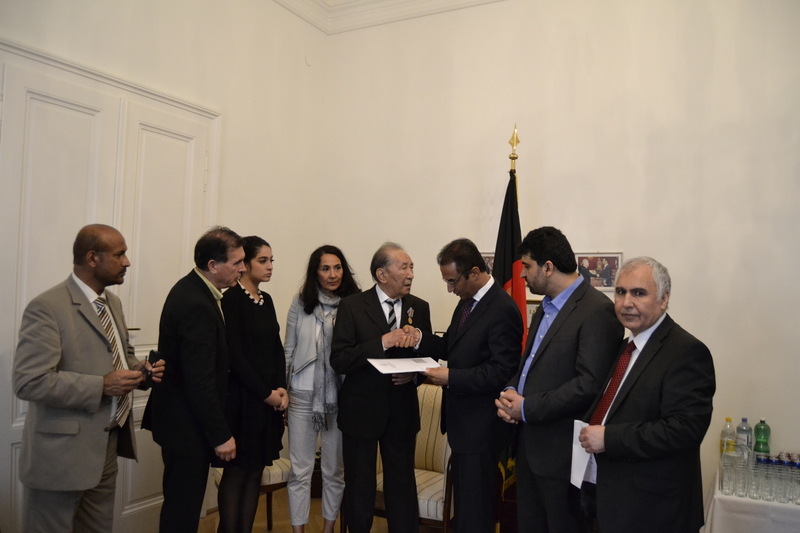 On behalf of President Karzai and the Afghan Government, the Embassy and Permanent Mission of Afghanistan held a medal ceremony for the honourable Professor Ali Mohammad Zahma at the Embassy Residence to bestow upon him the Medal of Mir Bacha Khan. The revered accolade was presented to Professor Zahma to mark his achievements and contributions to culture and education in Afghanistan. 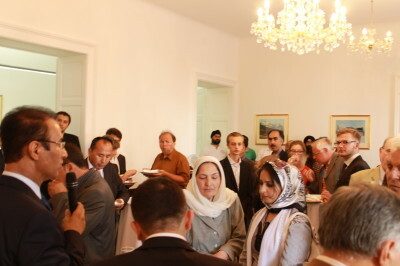 A group of Afghans and foreign diplomats in Austria joined the celebration at the Residence, in addition to the Deputy Minister of Counter-Narcotics, Mr Sherzad and his delegation visiting the UNODC, and Embassy staff. Ambassador Erfani welcomed the guests to the event and expressed his respect for the achievements and activism for Afghanistan that the Professor accomplished during his illustrious career as an academic and government official in Kabul and abroad. Professor Zahma took the floor to share brief remarks about his experiences in Afghanistan and thanked those present for such a high honour and his wishes for a stable and prosperous future for Afghanistan. He expressed his great desire, in his old age, to once more have the chance to visit his beloved homeland. Upon presenting the medal at the ceremony’s conclusion, H.E. Ambassador Ayoob Erfani took the floor, lauding the Professor and hoping that future generations shall also live in his image, to work towards a better future for Afghanistan through promoting the importance of education and equality amongst all Afghans. He wished the Professor a long and healthy life and his wish that the Professor continue his contributions during the coming Decade of Transformation, with guests supporting that sentiment. Professor Zahma attended Habibyar High school in Kandahar. After his secondary schooling he attended the University of Kabul and then went to work for a period at the Ministry of Education. Whilst working he also became a prolific author of a number of books, poetry and translator of texts. He completed a master’s degree at a university in London and returned to Kabul as a Professor of Afghan and Persian Literature in the Literature Faculty at the Kabul University. He also completed a tenure as a literature Professor at Beijing University, China. 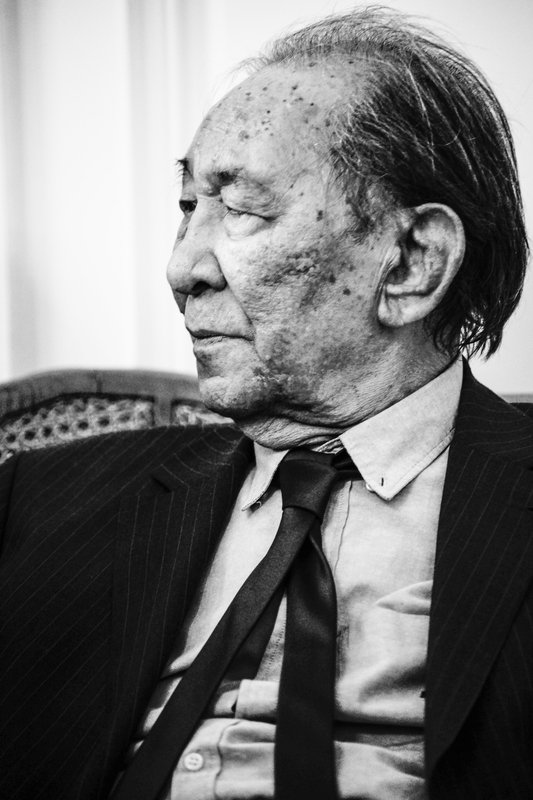 Professor Zahma suffered and left the country for Hungary in 1985, after the communist takeover. From there he moved to Vienna, Austria, where he has lived since with his wife and children promoting education and Afghan culture. Heide Amato-Koller lebte als Kind in den Fünfzigern in Afghanistan. Nun schildert sie ihre durchaus schönen Erinnerungen in einem Buch. Mrs Amato-Koller signs one of her books. Es ist ein heißer Nachmittag in der afghanischen Botschaft in Wien. Der kleine Saal, geschmückt mit Kristallleuchtern und goldbraunen Vorhängen, füllt sich mit unterschiedlichsten Gästen – mit Männern in feinen Anzügen und Frauen mit Kopftüchern oder dunkler Langhaarfrisur. Eine etwas nervös wirkende grauhaarige Frau mit vielen Papiertüten in der Hand sticht aus dieser Menschenmenge hervor. 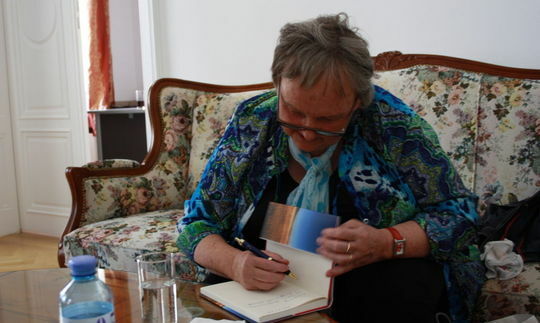 Sie setzt sich zwischen den afghanischen Gesandten und den Botschafter hin und legt ein Buch auf den Tisch. Das Buch umfasst mehrere Geschichten aus der Perspektive eines Kindes, als auch Briefe und Fotografien, die ihr Vater aufgenommen hat. Auch die wichtigsten historischen Ereignisse jener Zeit werden im Buch prägnant dargestellt. Das 100-seitige Werk erschien heuer im März im Eigenverlag. Beim Schreibprozess sei der anwesende „Ghostwriter” Mario Jandrokovic eine große Hilfe gewesen. Angefangen hat die Geschichte mit der Bewerbung ihres Vaters für eine Stelle in Kabul. „Als Gymnasiallehrer hatte er in Tirol keine großen beruflichen Aussichten gehabt. Nach halbjährigen Vorbereitungen reisten wir endlich ab. Vom Mailand nach Karatschi mit Propellerflugzeug, dann quer durch Pakistan mit Zug, schließlich mit dem Auto über Chaiber- Pass nach Kabul.” Die langwierige Reise, auf der sie Nomadenvölker, Oasen und eine unerträgliche Hitze begegnet sind, klingt wie eine exotische Erzählung aus Tausendeine Nacht. Ab und zu unterbricht sie sich entschuldigend und sagt, sie wird wirklich nur noch einen kurzen Aufsatz lesen. Später, in einem ein wenig privateren Gespräch, erklärt sie, das sei ihr erstes Buch. „Das Publikum ist für mich etwas ganz Neues. Ich bin gar nicht an diese Aufmerksamkeit gewöhnt!” Nachdem sie das Buffet mit afghanischen Spezialitäten eröffnet und sich die meisten Gäste neugierig um das Essen drängeln, darf sie sich wieder auf dem Sofa im Büro des Botschafters niederlassen. Auf die Fragen, welche Sprache sie in Afghanistan gelernt hat und wie viel Kontakt sie mit den Einheimischen hatte, antwortet sie lächelnd: „Ich war in einer kleinen deutschen Privatschule, in der Deutsch und Englisch unterrichtet wurden. Wie gesagt, habe ich nur eine afghanische Freundin gehabt. Alles andere über Afghanistan und seine Einwohner habe ich von meinen Eltern erfahren.” Obwohl sie nicht wirklich reisen durften, verbindet Amato-Koller sehr positive Erinnerungen an jene Zeit. Es sei in den Fünfzigern für Frauen viel einfacher gewesen in die Schule zu gehen, zu studieren und in Kabul ohne männliche Begleitung Spaziergänge zu machen. „Ich war viel freier wie später in der Ursulinenschule (Anm. : Mädchengymnasium) in Innsbruck”, sagt sie schmunzelnd. Die Frage, warum sie später nie mehr in Afghanistan war, kann sie sich selbst nicht beantworten. Zurzeit wäre es ihr aber zu gefährlich: Ich würde zwar natürlich gerne wieder nach Afghanistan fahren und das Land so sehen, wie es jetzt ist. Aber ich habe zu viele Bedenken”, sagt Amato-Koller und meint damit prekäre Sicherheitslage im Land. Afghanistan wünsche sie jedenfalls nur das Beste. Ambassador Erfani and Minister-Counsellor Wahab Arian meet with Afghan religious leaders in Vienna to condemn the recruitment of Afghan Youth to the fight in Syria. 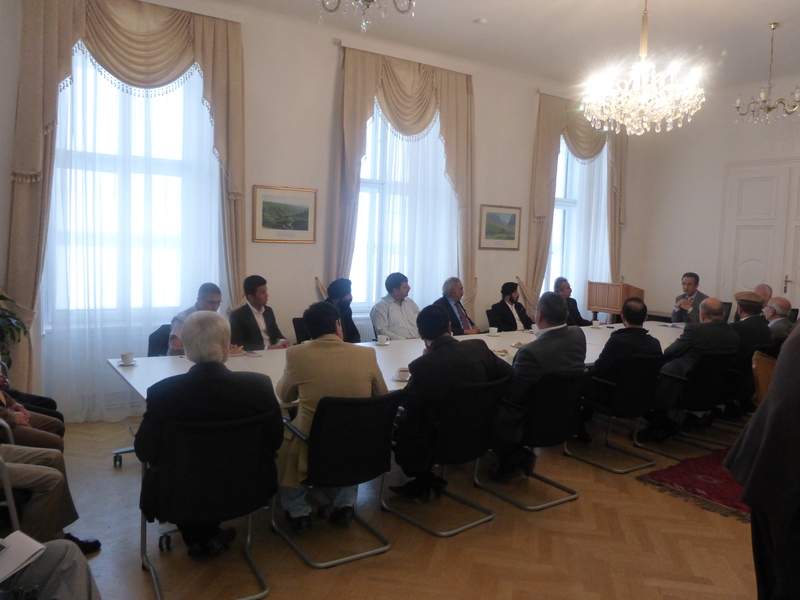 Today, Ambassador Erfani and Minister Counsellor Wahab Arian met with a selection of religious leaders from the Afghan community in Vienna to condemn the continued recruitment of Afghan youth in Vienna to the war in Syria. During the past period, a number of Muslim youth have been apprehended attempting to cross the Austrian border to fight in Syria. 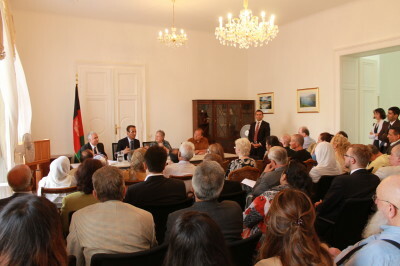 Ambassador Erfani thanked the leaders for their attendance and called upon their support during this difficult time, where all Afghans must be united to direct the Afghan youth in Austria to respect the laws of the host country, continue their education and to see the disastrous effects of engaging with recruiting teams who would see our youth head to Syria for the wrong reasons. Ambassador stated that “it is in all our interests to unite against such unsavoury elements, as we have seen in Afghanistan’s past, who would lead our youth astray and see an unstable, hostile Afghanistan return”. Following the Ambassador’s warnings and suggestions, the group discussed the best way to tackle the issue of recruiters in Austria and to dissuade the youth from following such bad examples. 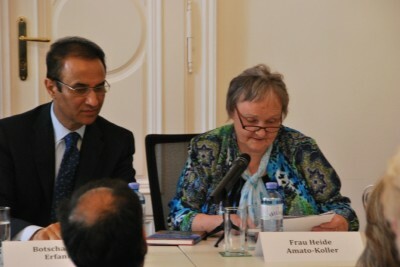 They discussed the importance of preaching good values in the Mosques in Vienna, to encourage Afghan youth to participate positively in the host country and be thankful for the unity, solidarity and peace in the country, and to know the effects of war that their forefathers have experienced. Additionally, Ambassador Erfani noted the importance on togetherness in the Afghan community in Austria and encouraged attendees to remain supportive of each other and their children. If you know of anyone who you suspect of being in contact with such recruiters or may be in danger of being recruited, please be in contact: embassy@afghanistan-vienna.org or +43 (0)1 4021006 or call the Austrian police. Today the celebrations for the 50th anniversary of the G-77 continued at the Vienna International Centre. Ambassador Erfani inaugurated this second day with an introductory statement on the achievements made and the goals ahead of the Member States. He addressed the importance of gender equality, youth participation and cooperation across borders and among G-77 Members. Once the festivities were declared open, two Afghan musicians provided an insight into the traditional music. The Tabla, a musical drum, and the Rabob, a lute-like musical instrument, are traditional key instruments of Afghanistan. Thereafter, Sri Lanka joined in the festival and introduced its culture with dances, costumes and music. Many guests watched and enjoyed the cultural performances. At the same time, Afghanistan offered a stand with a variety of traditional handcraft, artefacts and food. The participants appreciated the unique opportunity to see Afghan jewellery, stones and tableware. One of the highlights was a selection of traditional Afghan food, including sabzi and pilaw. Egypt, Cuba, Oman, Qatar, Sudan and the Vienna branch of G77 also had their own stands and provided food and brochures. In conclusion, the 50th anniversary of the G-77 was a great success for Afghanistan and His Excellency Ambassador Erfani. The whole delegation, as well as friends from the Afghan community here in Vienna enjoyed celebrating the ceremony together and showing their commitment to the objectives of the G-77, namely assuring joint action for economic and social development.